MEMPHIS -- There is lots of hugging in the playoffs. It's part of the culture this time of year. There are hugs for celebration, those are the most common. There are hugs for condolence -- those are usually one-way. There are hugs out of habit -- there's so much walking in and out of huddles that they become little stress-relievers. 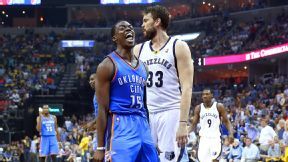 But the reason for Kevin Durant's grasping of Reggie Jackson at the conclusion of the Oklahoma City Thunder's vital 92-89 Game 4 overtime victory over the Memphis Grizzlies late Saturday night was from a different branch. It was a goat-removing hug, a save-me-from-accepting-the-MVP-trophy-after-being-eliminated hug, an "I love you" hug. It seemed like it lasted five minutes, with other teammates lining up behind Durant to hug Jackson. And when they were done hugging him, Durant had gotten back in line to hug him again. Andy Lyons/Getty Images Reggie Jackson scored 32 points and lifted OKC when its stars were not shining. "I love you, man, I love you," Durant whispered into his ear. "I love you," Jackson said as he tried to fight back tears. Yeah, that's sappy when it's retold and might seem a little overboard for a non-elimination game in the first round of the playoffs. There was no question about its authenticity, though, because Jackson had bailed Durant and Russell Westbrook out of another horrid shooting performance and perhaps a summer full of regret. In their careers, which are now 474 games deep including the playoffs, Westbrook and Durant had never combined to shoot as poorly as they did in Game 4. They were a hellacious 11-of-45, Durant short-arming his attempts and hitting front rim, and Westbrook forcing everything as if he could solve a finesse problem with more throttle. It was just the second time in their careers they'd both shot worse than 30 percent in the same game. The last time was more than four years ago in a meaningless regular-season game in which they went "only" 4-of-20. This has been perhaps the worst week of offensive execution in their time together, shooting 53-of-154 (34 percent) in the three games. And that 23-of-56 they put up last Monday in Game 2 seems like it'd be a great dream after their two games of bricklaying in Memphis. It's like the Thunder's offense, which has consistently been one of the best in the league for the past four years, has come down with a parasite. And yet, will all that, they boarded their flight home with the series tied 2-2. Frankly, the Thunder should be down 3-1 and have their backs against the wall. They are not because Jackson happened to have the best game of his career when his star teammates were basically at their worst. Jackson had a career-high 32 points, 17 of them in the fourth quarter and overtime, including the last five points of regulation in the final minute. His 3-pointer in traffic with 59 seconds left at the end of shot clock when the Thunder were down five points, might end up being a genuine "save the season" moment. "Huge shot," Grizzlies coach Dave Joerger said. "My hat's off to him." It unfolded as Durant and Westbrook actually seemed to be backing away from the ball, letting a backup control their destiny. At least they couldn't be criticized for hogging the ball as they clearly did in Game 3, when they reacted to not being able to make anything by donning blinders. This night, they sometimes looked like they just didn't want the ball, Durant often just standing in the corner or catching and passing within a second. That'll happen when a player goes 1-of-15 on 3-pointers over two games. "We were struggling there," Durant said. "And he just took over. He made huge, huge plays, and I'm so proud of him." In the first three games of the series Jackson was just 3-of-19 shooting. Coach Scott Brooks had slashed his playing time because of it, and it made his tentative play only worsen. But someone got to Jackson between Games 3 and 4 and reminded him that although Beno Udrih might be having a magical series for the Grizzlies offensively, he should not be able to defend the super-quick Jackson. Nor should Mike Miller, the sharpshooter whom Joerger was sometimes getting away with having defend Jackson. By the overtime, Joerger had pulled both Udrih and Miller because Jackson was finally destroying them. And Durant and Westbrook were letting him bring the ball up the floor and looking for him when they got touches. Brooks was calling plays for Jackson in timeouts. The Thunder were scrambling for their playoff lives, and they were riding their third guard. "I was seeing it in their eyes, they wanted me to keep going," Jackson said. "I was bringing it up and they weren't stopping me. We lean our two stars, but their shots weren't going." This is just the second series in NBA history to have three consecutive overtime games, the other being a Chicago Bulls-Boston Celtics series back in 2009. So, obviously, there are a lot of other things going on that are flipping these games. One of them is Kendrick Perkins, who is playing world-class post defense on Zach Randolph. After being eviscerated in the series against the Grizzlies last year and routinely ripped for being one of the least valuable starters in the league, Perkins has been putting on a clinic in keeping Randolph out of his spots. The Grizzlies' power forward had 10-of-34 shooting in the past two games, and it actually led Joerger to bench him for 12 straight minutes in the second half in an unexpected turn. Memphis also missed 10 free throws in Game 4 and wasted numerous chances off Thunder turnovers, scoring just four points off 13 of them in the first half. They might have come in as the underdog, but the Grizzlies have consistently been the better team throughout the first four games, mostly because Durant and Westbrook have been so off their offensive games. But for the third consecutive game, the Griz blew a two-possession lead in the final minute and ended up playing in overtime. That's just too many chances to give a team like the Thunder, even when they're leaking oil. At least there was no four-point play this time. It was just Jackson following up that 3-pointer with a floater to force overtime and Memphis' inability to get a big basket to match it. When Michael Conley's attempt to tie at the overtime buzzer missed -- and man, it was right on line -- the Grizzlies had their 15-game home win streak snapped and had to feel like they'd totally just let their quarry off the hook. And letting it be Jackson who beat them made the taste worse as they face returning to Oklahoma City for the pivotal Game 5. "I was never expecting something like this to happen, especially in the playoffs," Jackson said. "I was just happy to be in that moment." MVP: Monta Ellis had it all. After an uneven first half, Ellis came alive in the fourth quarter, going 5-for-5 from the field and scoring seven points in the final 1:37 of the game, including a crucial and-1 running jumper. Ellis' frenetic closing rush is also what distracted the Spurs' defense on the final possession of the game. Defining moment: What else could it be? Half-man, half-game-winner. After a pedestrian 3-for-8 shooting afternoon, Vince Carter curled to the left corner as a tertiary option with 1.7 seconds left in the game, knocking down a fallaway corner 3-pointer at the buzzer. That was ... a tactical master class: This is billed as the Spurs versus the Mavs, but it could just as easily be chalked up to Gregg Popovich versus Rick Carlisle. In-game adjustments, efficient offenses and every closing moment feels less about which team will have the ball last and more about which coach gets to set up his scheme. Because they're taking whatever they want. MVP: Paul George came up big to lead the Pacers, who tied the series at two games apiece. George scored 24 points, none of which were bigger than the 3-pointer he hit to take the lead with 2:11 left in the game. X factor: George Hill, who responded to his 1-for-10 showing Thursday by scoring 15 points on 5-for-8 shooting. Hill also had five assists and only one turnover. Defining moment: With 1:32 left, David West found the ball in his hands behind the 3-point line. West knocked down the open 3, only the second of his playoff career, to give the Pacers a four-point lead that they wouldn't relinquish. MVP: It may be boring, but sometimes the best player in the game just happens to be the best player in the game. With 30 points, 10 rebounds and 6 assists, LeBron Raymone James wouldn't let up and allow the first game in Charlotte to be a letdown for the Heat. Defining moment: Halfway through the third and with no one in front of him, James stormed to the basket and cast a pointed glare towards the sidelines and Bobcats owner Michael Jordan before hammering home a thunderous dunk. It was a spark of life in an otherwise forgettable blowout. X factor: Turnovers. Although the Bobcats went into the break down 12, it all happened in a flash right at the end of the half. But instead of responding, they coughed up the ball four times in the third for eight points while the Heat turned it over just once for no points. There was no coming back after that. MVP: Reggie Jackson. Kevin Durant and Russell Westbrook didn't have it going tonight. Luckily, Jackson did -- in spades. First, he scored the final five points of regulation to send the game to overtime, then he calmly sank the last four of his 32 points in the extra frame to seal the game. LVP: Zach Randolph. Z-Bo couldn't get good positioning down low, resulting in a paltry 5-of-14 shooting night. Though he hadn't been shooting well for the entire series, he made up for it by getting to the line. Saturday, he was just 1-for-5 from the stripe. That was ... season-saving. The third (over)time's the charm for the Thunder, who head back to Oklahoma City tied 2-2 instead of facing a 3-1 deficit. You have to wonder how much each team has in the tank after a third straight overtime game. Reggie Jackson, Thunder: With OKC's stars struggling, Jackson scored a personal playoff-best 32 points, and the Thunder beat the Grizzlies 92-89 in OT, tying up their first-round series at two apiece. Jackson had scored only 15 points combined in this series but hit 11 of 16 in this one. Memphis Grizzlies' serial lead-surrendering. With a 3-1 series lead in their grasp, the Griz saw OKC squirm out. After Marc Gasol sank a jumper with 80 seconds left, the Griz had a five-point lead. Of course, then Reggie Jax struck for five points, and the Griz had blown a fourth-quarter lead for a third straight game. "@ESPNNBA: LeBron took a look in Michael Jordan's direction before going up for the dunk. pic.twitter.com/p3DJbf3hzg" THE KING of all Courts! "There's no room for Donald Sterling in the NBA." 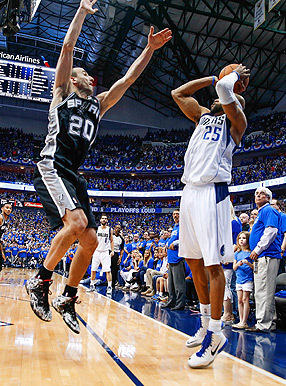 Kevin Jairaj/USA TODAY Sports Vince Carter prepares to sink the game-winning 3-pointer over Manu Ginobili in Game 3. The win gave the Mavs a 2-1 series lead over the No. 1 seed heading into Monday's Game 4. Atlanta posted a .463 win percentage in the regular season. Should the Hawks go on to win this series over the Pacers, they would be the second-worst team in NBA history to win a best-of-7 playoff series. The 1958-59 Minneapolis Lakers posted a .458 win percentage but still managed to make it to the NBA Finals, defeating the St. Louis Hawks in a best-of-7 series along the way. The Lakers were eventually swept by the Celtics in the NBA Finals.